During my Greek island sailing trip, I visited 12 islands and Athens. While I only spent about 24 hours or less on each island, it was enough to tell you which islands were my favorites. Believe it or not, Santorini was not my favorite. 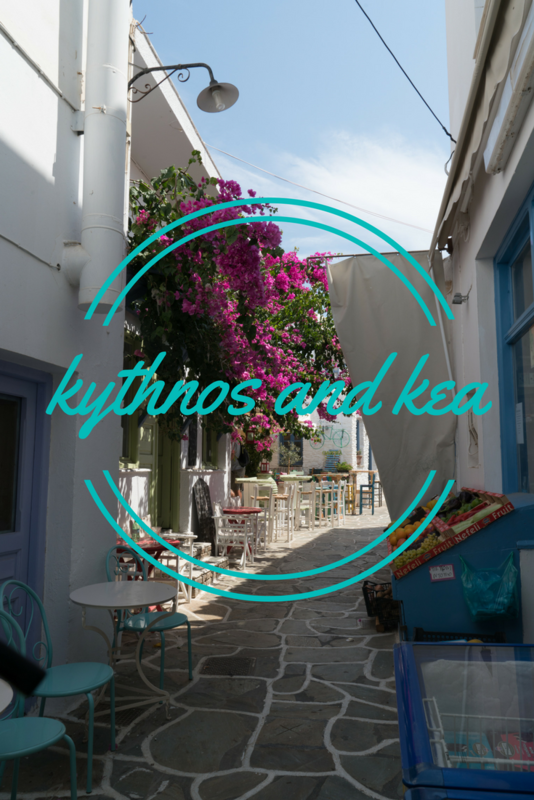 Kythnos and Kea are two Greek islands in the Cyclades I would like to consider spending significantly more time exploring. 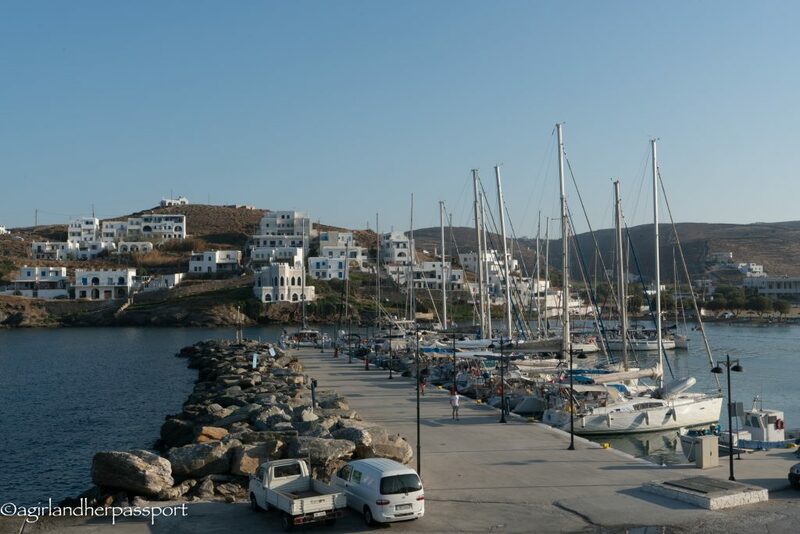 The fourth Greek island we docked in was Kythnos. The first night we were on Kythnos, we slept in Kolona Bay. 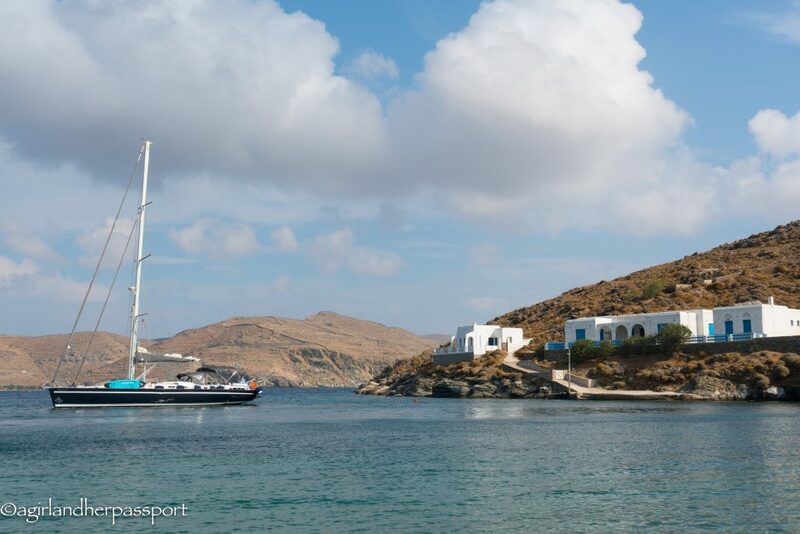 We anchored in the natural harbor between Kythnos and a smaller islet. The beach is nice soft sand, which is not the norm in Greece. There were not too many other people at Kolona Bay. I explored the surrounding hills. There is a small restaurant and bar on the Kythnos side if you want a meal or a beer. We had a sandpit barbecue. The next day we sailed around the island and docked at the town of Loutra. 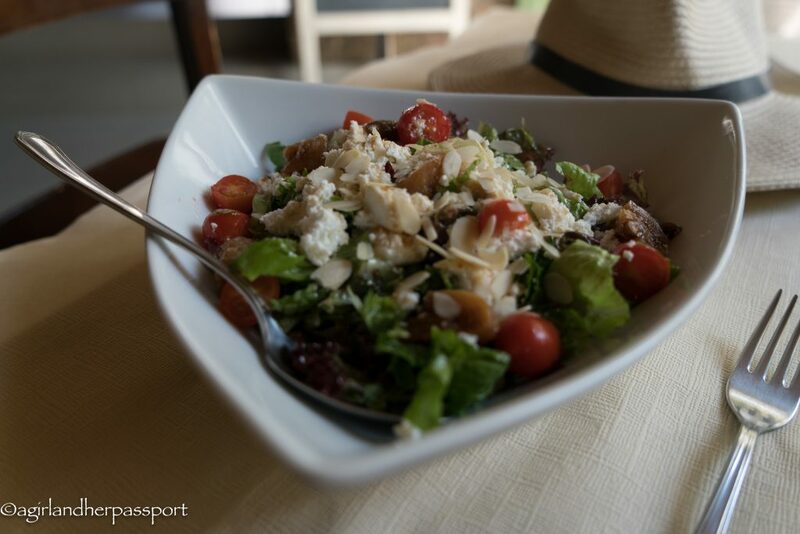 The captain recommended heading up to the hilltop Chora, the Greek word for village, for lunch and to see the town. Several of us piled into one of the two taxis on this side of the island and headed up the winding road. Immediately saw the charm of the village. 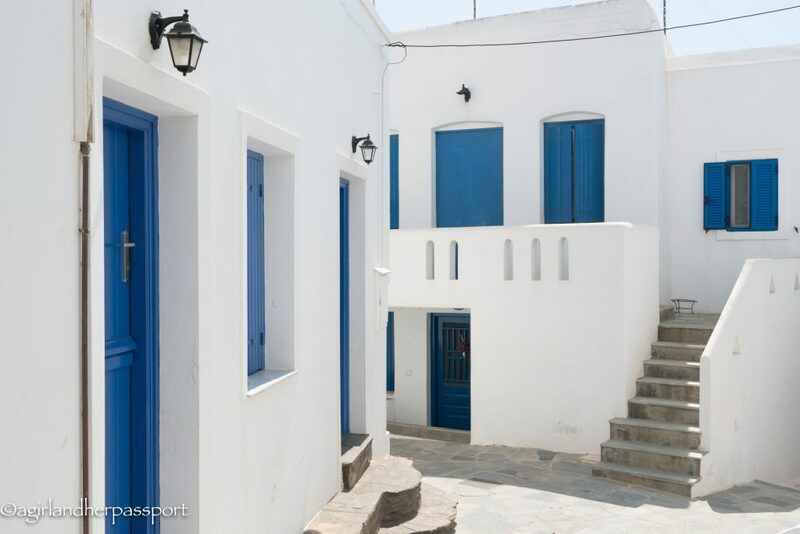 It is the more quiet, but equally beautiful version of Santorini. Not only that but I had the best meal of my life there. After wandering the town, I decided to eat in the main square where the taxi had dropped us. The restaurant was called Messaria, which is the official name of the town. I ordered the fig salad with almonds and the baked eggplant. Both were divine despite their simplicity! The seasoning was just perfect. I really want to try to recreate the eggplant dish myself. 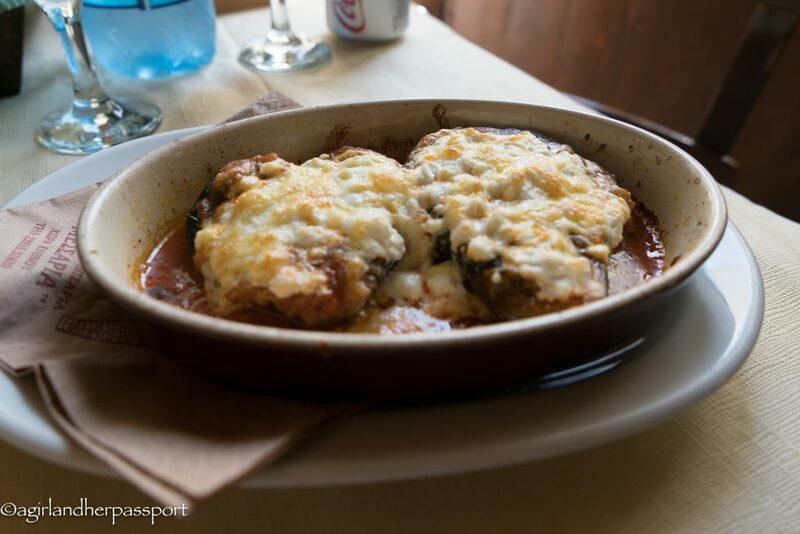 The eggplant is baked with tomato sauce, cheese and spices. The astounding food didn’t stop with lunch. That evening we visited Sofrano Yachting Club Restaurant. Since having mussels last summer in Italy, I have become obsessed. I ordered the steamed mussels. The mussels had been steamed in a combination of ouzo, garlic, and possibly white wine, which made a sauce so good I dipped my bread in it after the mussels were all gone. Sadly, we sailed from Kythnos the next morning and didn’t get the chance to enjoy the natural hot springs. 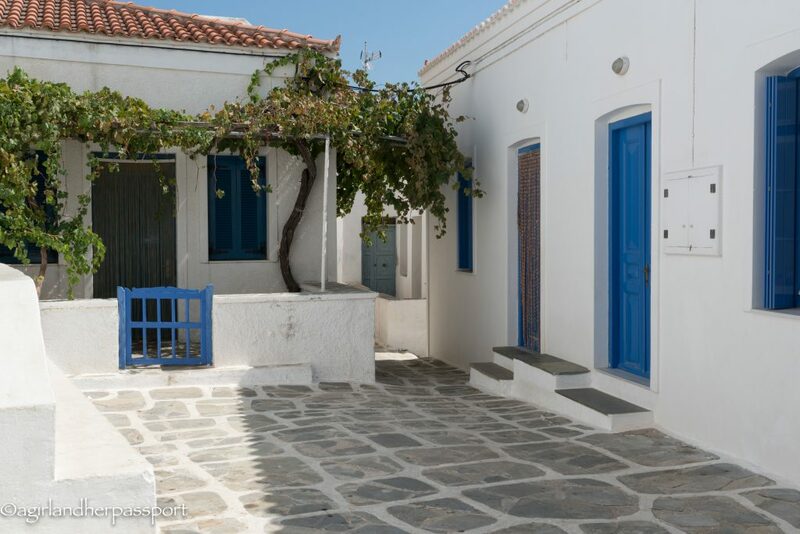 Book hotels in Kythnos at Hotels.com or Booking.com. Sailing into the small island of Kea, I was really happy for a quiet port. We docked in the small village of Vourkari, which is down the road from the larger port of Korissia where the ferries from Athens arrive. The second week of sailing was rougher than the first and I hadn’t been getting much sleep due to that and we had been on larger islands with busy ports. Vourkari is a small quaint Greek village. We arrived late in the afternoon, allowing us just enough time to walk to down to the small beach before dinner. The beach was not as rocky as some Greek beaches and there is a beach bar with loungers available. After dinner, we walked around feeding the stray cats our leftover dinner scraps and enjoying exploring the island. We headed up to the Chora of Kea the next morning. We walked (hiked, really) to the see the Lion of Kea. It’s a steep climb down to the lion, but worth getting a close-up picture of it. 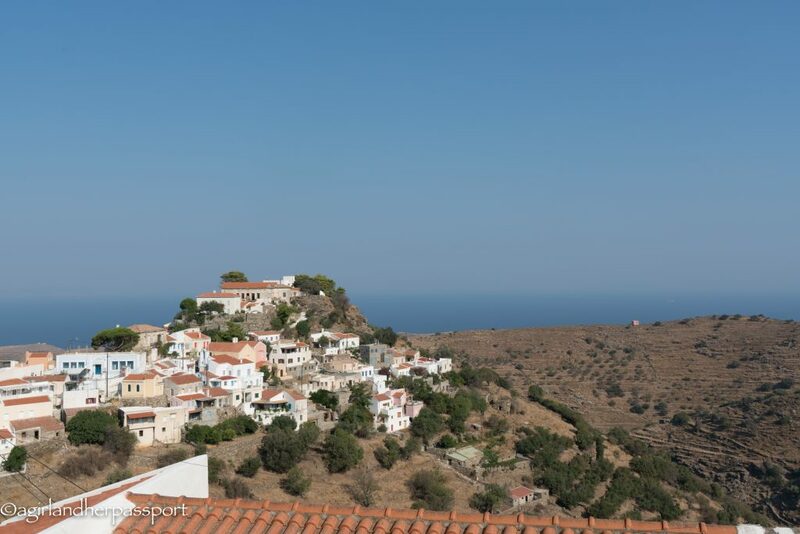 Going back to the Chora make sure you take a look around at the amazing views down to the sea and the surrounding homes. Kea also appealed to me because it was quiet, the people were nice and Vourkari had a nice vibe of everyone knowing each other. I wanted to rent an apartment and stay for a month or so on this lovely island of Kea. Book hotels in Kea on Booking.com or Hotels.com. Have you been to any Greek Islands? Which ones were your favorites? I really want to go there too seeing your post and my friend’s photo yesterday! You should! Can you send me a link of the photo? I’m curious now! What a lovely trip! 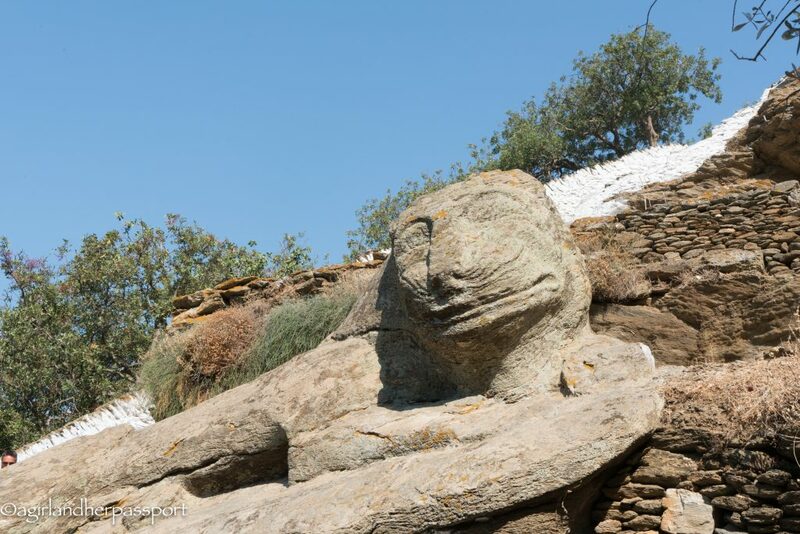 I’ve been to Crete – and love the island and the people – but there’s so much more to Greece than the typical “package holiday” locations, and I’d love to try them out! I know. There are 227 inhabited islands in Greece! So much to see. I foresee many trips to Greece in my future. Those islands look lovely. I went to Kos many years ago and loved it. Kos is on my list of Greek islands to visit! Never heard of these places before, but your post made me want to go! I’m so glad to hear that! You will love them. We spent half our honeymoon on the Southern side of Crete (in a teeny place called Loutro) If you ever head back, I can’t recommend that enough! I am going to Greece in September and staying on Ios but maybe I can go there after. Thanks!! I am pleased that you mentioned that Santorini was not your favourite. We enjoy the less popular places as they seem more ‘real’. It was just so crowded and I hate that. I definitely enjoyed the smaller islands.